The Washington Elementary School STEAM Academy modernization completed by Landmark Construction in 2016 won a Leroy F. Greene Design and Planning Award. The Coalition for Adequate School Housing (CASH) and the American Institute of Architecture presented the Award of Honor for Modernization/Transformation to the Sacramento City Unified School District and HMC Architects at the annual CASH conference on School Facilities held February 20-22, 2017. 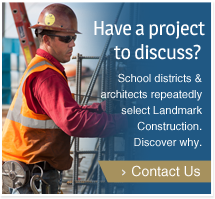 Landmark Construction completed the winning revitalization project in less than 70 days, and the formerly shuttered campus re-opened on August 25, 2016 as a Science, Technology, Engineering, Art, & Math (STEAM) Academy. The new school serves neighborhood residents as well as attracts students throughout the region as a magnet school. The school site had been closed in 2013 due to low enrollment. HMC Architects worked with the school district to rebrand the school as a STEAM Academy with a train theme and incorporate the locomotive concept into the design as well as through class emblems, a feature wall, and international train station GPS coordinates in the flooring. HMC Architects’ design repurposed the building space to create learning environments conducive to teaching students 21st century skills. Landmark Construction rehabilitated the 1970’s era campus by building a more welcoming entry, transforming interior spaces into flexible, collaborative learning spaces with better lighting and incorporating outdoor learning courtyards into the classroom space. The school selected mobile furniture, makerspace tables with electricity, folding writable classroom partitions, and peg boards for tools and materials to support hands-on, project-based STEAM learning. Space was updated for storage and preparation as well as to offer reading nooks and flexible classrooms.